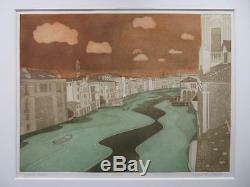 JOHN BRUNSDON "Grand Canal Venice Italy". 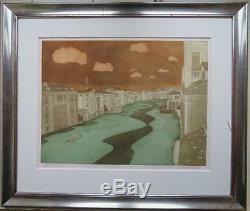 36/150 MEDIUM: Etching with aquatint SIZE: 87cm x 75cm framed CONDITION: Very good / excellent - very light staining around paper margins DETAIL: A great large etching by John Brunsdon- one of our favourite British printmakers. 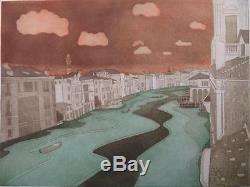 This work depicts the Grand Canal - part of Brunsdons collectable Venice Italy series. In 1945 he entered Cheltenham Grammar School and in 1949 enrolled at the Cheltenham College of Art, then under the direction of Stanley Dent, an etcher of some standing and Ken Oliver. He then completed his National Service and in 1955 studied etching at the Royal College of Art for three years having been interviewed and accepted by Robert Austin two years previously, and it was Julian Trevelyan, Head of Etching at the Royal College of Art, who, more than anyone else, provided a vigorous arid fundamental influence, his other teachers included Edwin La-Dell, Alaster Grant, Edward Ardizzone and Edward Bawden. Brunsdon has never worked directly from nature his method is to draw and photograph the subject and work out ideas in the studio. One of Britain's most distinguished printmakers, an Associate of the Royal College of Art and a Fellow of the Royal Society of Painter Printmakers. In 1959 he began teaching portrait painting part-time at St. Albans School of Art and had his first exhibition at the Zwemmer Gallery in 1961 and in 1963 moved to Woburn, Bedfordshire. In 1965 a founder member of the Print Makers Council with Michael Rothenstein, Valerie Thornton and others and, in the same year, had his first one man show at Lund, Sweden, his first one man show in UK was at the Curwen Gallery, London in 1967. After establishing printmaking at St.
Albans School of Art, with assistance from the Principal, Anthony Harris who was teaching full-time, Brunsdon became one of the first artists to join Christie's Contemporary Art. In 1977 he retired from teaching to concentrate on etching, moving to Stradbroke, Suffolk where his time was devoted to his printing studio where all his work was individually hand etched, inked, coloured and printed. He took delight in the texture and decorative qualities of etched marks and the sweeping shapes of broad colour which fuse into timeless images. The landscape of Suffolk and Norfolk now features in his work and in 1983 he moves from Stradbroke to an isolated 16th century Suffolk cottage. He has had major exhibitions at The Royal Academy Summer Exhibition (1974), the Alice Simsar Gallery, Ann Abor, Michigan, USA (1975), the Galarie L'Angle Aigue, Brussels (1980) the City churches of St Mary Le Bow and St Catherine Cree, London (1988) the Chapman Gallery, Canberra, Australia and at Heffers Gallery, Cambridge. His commissions included Sea Containers for the Hotel Cipriani; The Council for the Protection of Rural Britain; The National Trust and The Shakespeare Birthplace Trust. John's work is represented in the Arts Council, Tate Gallery, The British Council, V&A, MOMA, New York, Scottish Museum of Modern Art and many other public collections. Selected commissions include the National Trust, Council for the Protection of Rural Britain and Illustrated London News and a full member of the Royal Society of Painter Printmakers. Frames: Because of the fragile nature of picture frames, all frames are offered free with the painting. Jubilee Galleries specialise in Fine and Applied Art from the late 18th to the late 20th Century. Our particular interest lies in Mid Century modern art and design but appreciation is broad and therefore you may find anything from 1780's portraits to 1980's etchings. We also offer bank transfers for UK buyers. Please make cheques payable to Jubilee Galleries. Replacement glass costs just a few pounds, is easily fitted, and saves the strong likelihood of your artwork getting damaged in the post if glass were included. You are also welcome to collect from our address near Cirencester, Cotswolds at no charge. To get in touch with us. Attention Sellers - Get Templates Image Hosting, Scheduling at Auctiva. 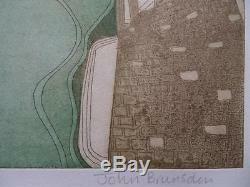 The item "JOHN BRUNSDON (1933-2014) Fine LIMITED EDITION ETCHING Venice Grand Canal" is in sale since Sunday, August 20, 2017. This item is in the category "Art\Art Prints". 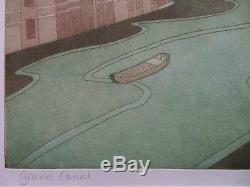 The seller is "jubileegalleries" and is located in COTSWOLDS. This item can be shipped worldwide.